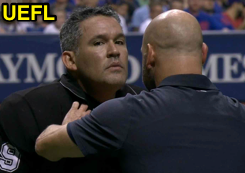 Manny Gonzalez took a baseball to the throat in Tampa Bay when a wild pitch bounced behind home plate and briefly wedged between Gonzalez's mask and neck before falling to the ground. Gonzalez is evaluated following the hit. With one out and one on (R1) in the top of the 8th inning of Wednesday's Cubs-Rays game, Rays pitcher Ryne Stanek threw a first-pitch breaking ball low and inside that bounced off the dirt and just below the bottom portion of Gonzalez's hockey-style mask. Gonzalez remained in Wednesday's game after the wild pitch. Relevant Injury History: On August 6, 2013, Gonzalez similarly suffered a lodged ball to the throat when a fouled-off bunt during the evening's Rockies-Mets game bounced off the ground behind home plate and into the throat area underneath Gonzalez's mask. That ball, however, stuck to Gonzalez and only became displaced after he reached in and removed it. Gonzalez left that game as a result of the injury.